Brickstarter is still just a prototype, bu the goal would be to move away from NIMBY, or “Not In My Backyard,” responses to development to a YIMBY, or “Yes In My Backyard” process where community members can proactively come up with ideas and solutions for what is needed in their neighborhoods. It is intended to be a place where grassroots ideas and insight can meet institutional resources. People can not only contribute money, but also their time. The prototype can be seen here, but the sample below shows how the site will basically work. 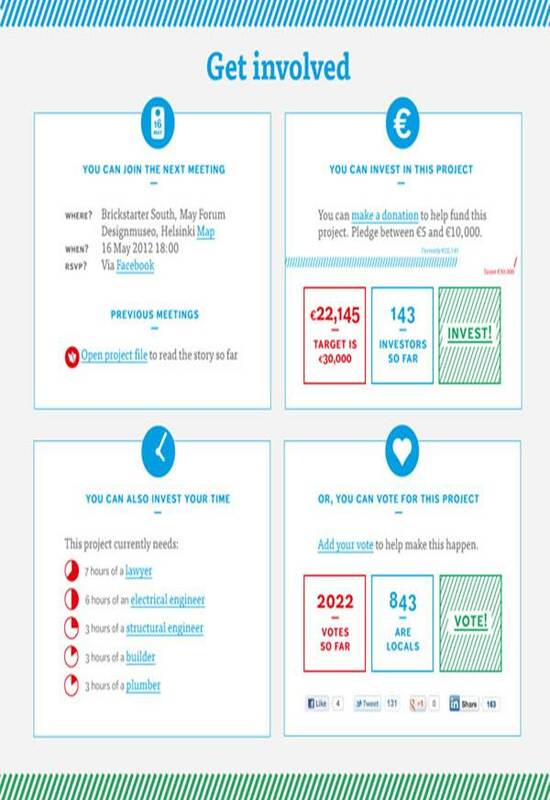 Brickstarter represents new ways of thinking about community engagement and decision making. Platforms such as this will hopefully expand the dialogue around community and economic development and allow more people to be invested in the outcomes. The real key to success for any community development initiative, however, is to ensure that those who are the most marginalized still have a voice in the process. As an online platform, Brickstarter will naturally exclude those who do not have web or computer access. But it would be very effective if it is used as a tool, in conjunction with face-to-face interactions and organizing. Entry filed under: Economic Development. Tags: community development, Economic Development.